COUAGNE (Coigne), MICHEL DE, officer in the colonial regular troops; b. 5 Oct. 1727 at Louisbourg, Île Royale (Cape Breton Island), eldest son of Jean-Baptiste de Couagne* and his first wife Marguerite-Madeleine de Gannes de Falaise; m. 19 Feb. 1758 at Louisbourg Jeanne Loppinot, and they had six children; d. 28 Oct. 1789 at Saint-Marc (Haiti). It was a frequent practice of the French crown to recognize the services of deceased officers by appointing their sons to posts in the armed forces. Michel de Couagne was created a gentleman cadet in the colonial regulars in 1740, soon after the death of his father, who had served on Île Royale as an engineer for 23 years. Michel served as a voluntary assistant engineer in 1742 and 1743, and participated in the taking of Canso in 1744 and the defence of Louisbourg in 1745 [see François Du Pont Duvivier; Louis Du Pont Duchambon]. Transported to France by the terms of the surrender of the fortress, he was commissioned lieutenant and assistant engineer on 6 Jan. 1747, and that year he took part in the ill-fated expedition to Canada of Jacques-Pierre de Taffanel* de La Jonquière. 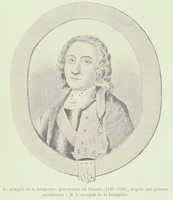 Having finally reached Canada in 1748, he assisted Gaspard-Joseph Chaussegros* de Léry for the next six years on the fortifications of Quebec, Montreal, and other places. In 1754, at the request of Louis Franquet*, director of fortifications for New France, he returned to Louisbourg with the full grade of engineer and was employed there until the capitulation of 1758 [see Augustin de Boschenry* de Drucour]. Franquet, who considered him one of his best engineers, procured him a promotion to captain on half pay in 1756, an advancement probably designed to give him the authority an engineer at Louisbourg required. During the siege of 1758 de Couagne demonstrated courage, diligence, and skill in siegecraft. In particular, he supervised repairs to the Island battery. De Couagne spent the years 1759 to 1763 at La Rochelle, completing the detailed fortifications accounts not only for Île Royale but also for Canada, writing appreciations of different kinds concerning the two colonies, and longing to return to his native island. It was the quality of his work on the Louisbourg accounts, with which he was intimately acquainted, that led the court to have him verify the Canadian records, of which he had no firsthand knowledge but with which he apparently also dealt competently. His letter of 4 Nov. 1760 on Île Royale (an excellent geographical source) strongly recommended the construction of a new fortified capital on Spanish Bay (Sydney harbour) if France repossessed the colony. Agricultural settlement, he urged, should be encouraged by the establishment of the seigneurial system in several fertile areas that had been largely neglected during more than 40 years of French occupation of the island. De Couagne further noted that the proper role of Louisbourg and the south coast had always been as a base for the fishery; this they should remain. His letter of 26 Aug. 1761 on Canada was concerned with the management of fortifications, the need for more trained engineers and fewer amateurs, and the improvement of procedures. He also recommended an end to the disastrous practice whereby officers in charge of construction at isolated posts sold wine and spirits to soldier-workers. 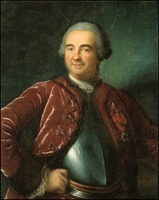 Promoted captain in January 1763, de Couagne was made a knight of Saint-Louis the following month. The same year he was transferred to Saint-Pierre and Miquelon, where he directed the construction of government buildings and harbour facilities, drew accurate maps and plans, and collected natural history specimens. He was unsuccessful in his bid to be designated second in command to his former colleague, François-Gabriel d’Angeac, now governor of the diminutive colony. Following his return to France at the end of 1766, de Couagne was posted to the colonial military depot on the Île de Ré, where he eventually became second in command and briefly served as commander of the company of cadets. Reduced to half pay in 1781, he complained to his relative the Comte d’Argenson of financial hardship – he and his wife had lost all their possessions at Louisbourg in 1758 – and in 1783 he was appointed king’s lieutenant of Saint-Marc on the island of Saint-Domingue (Hispaniola). A distaste for tropical climates, his continuing financial distress, and adverse decisions on promotion all made his years in the Caribbean colony difficult. So too did the severe fine he incurred in 1786 for failing to prevent a violation of the foreign-trade regulations in his district. His death in 1789 left his widow in desperate economic circumstances. AMA, Inspection du Génie, Bibliothèque, mss in–4°, 66, f.65. AN, Col., B, 78, f.393; 85, f.199; 87, f.208v; 91, f.261; 99, ff.244, 252v; 103, f.188; 121, f.649; 133, ff.139, 144; 136, f.104; C11A, 98, f.78; 105, f.296; C11B, 25, f.27; 34, f.12; 35, ff.282–83; 36, ff.268–70; 38, ff.169–70; C11C, 8, ff.82–91; C12, 1, f.100; 14, f.6; D1, 11, ff.59, 60v, 102, 118v, 241v; D2C, 2, ff.115v–16; 4, f.114; E, 94 (dossier Michel de Couagne); Section Outre-mer, Dépôt des fortifications des colonies, Am. sept., no.488; Saint-Pierre et Miquelon, carton 1, nos.7, 9–14; G1, 409/2, p.210; G3, 2045. PAC, MG 18, O6. Inv. des papiers de Léry (P.-G. Roy), II, 95, 110. Æ. Fauteux, Les chevaliers de Saint-Louis, 192–93. F. J. Thorpe, “COUAGNE, MICHEL DE,” in Dictionary of Canadian Biography, vol. 4, University of Toronto/Université Laval, 2003–, accessed April 24, 2019, http://www.biographi.ca/en/bio/couagne_michel_de_4E.html.